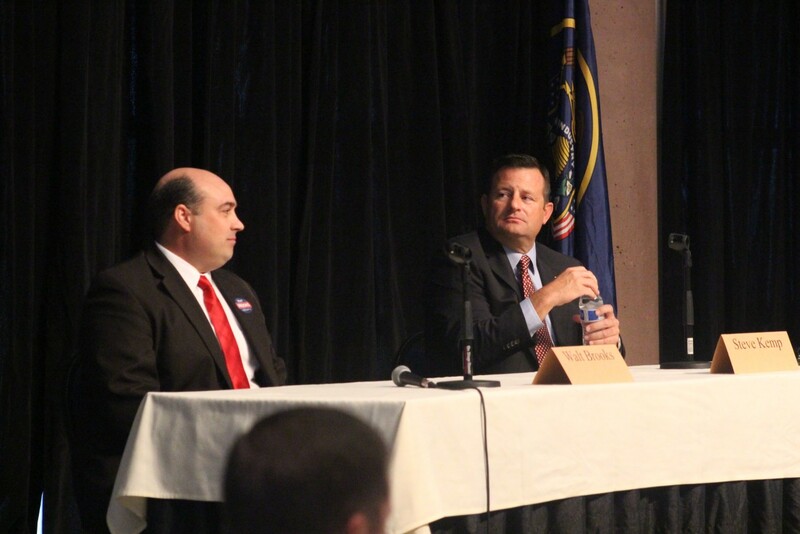 ST. GEORGE – The Republican candidates for House District 75 met for a debate at the Dixie Center St. George Wednesday and spoke to various issues, from economic development to the Lake Powell Pipeline. Walt Brooks and Steve Kemp are seeking the Republican nomination for the seat being vacated by Rep. Don Ispon. The debate was the second hosted by the St. George Area Chamber of Commerce Wednesday, the first of which was the debate between Washington County Commission candidates Gil Almquist and Dean Cox. During the debate, Brooks said everyone should take a stand for what they believe in. “It’s my turn to stand,” he said. 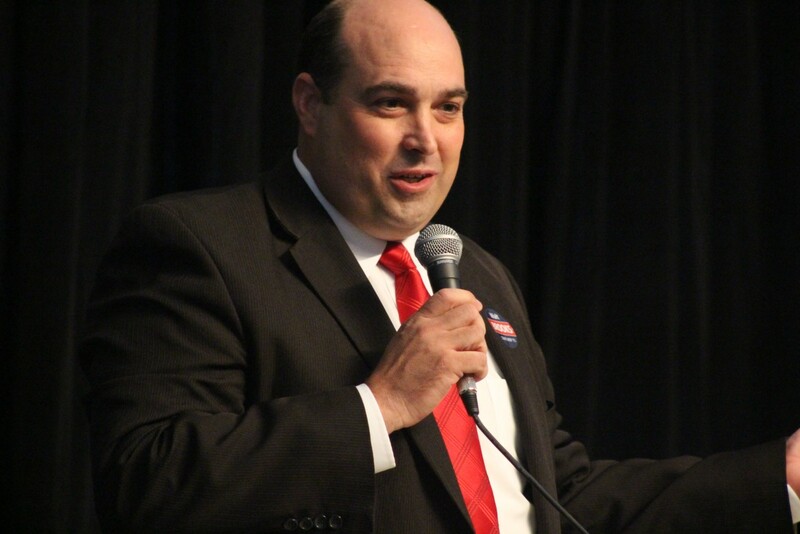 For Brooks, a businessman who runs a small software company, that stand involves making sure the Legislature adheres to the basic principles of the Constitution. 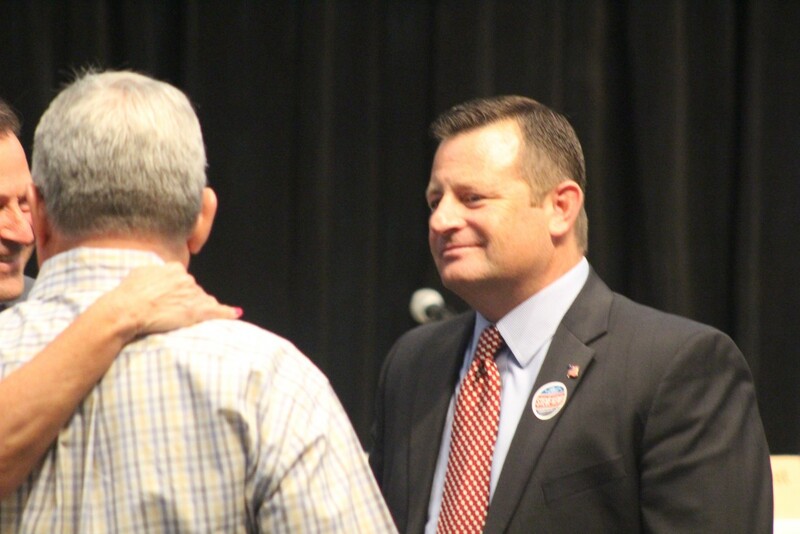 Kemp, a commercial realtor, said people should vote for him because he has a unique skill set that will allow him to be the most effective advocate for Southern Utah. One such skill he touted that he said would greatly benefit his potential constituents is his ability to negotiate — a skill honed by 20 years in the commercial real estate field. Both candidates agreed that reducing state regulations on business would help spur economic growth. 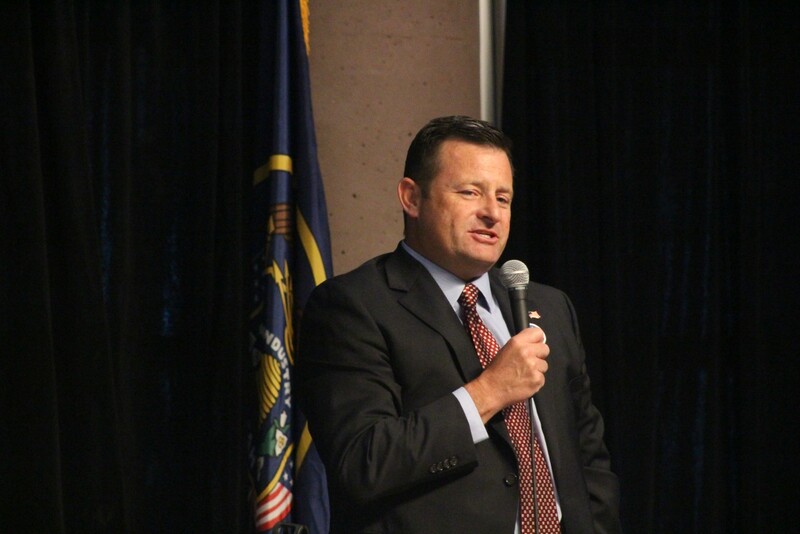 One agency in particular that Kemp said he wanted to cut the bureaucratic red tape on was the Utah Division of Occupational and Professional Licensing. Kemp also spoke to recruiting value-added businesses to Utah, using the example of the benefits of Site Select to Washington County. “We need to bring in value-added companies that will bring in fresh or new dollars to the table,” he said. Brooks said revenue garnered from the state’s proposed takeover of public lands management could be used to reduce taxes overall and benefit the state economically. The pending 140-mile pipeline is an issue where Brooks breaks from the majority of his Republican cohorts. While many — including Kemp — support the idea of the Lake Powell Pipeline with the caveat that it needs to be feasible and affordable, Brooks proposes an alternative. There would be work involved in piping the water from the Great Basin and negotiating with Nevada for the rights to the water, Brooks said, but it would be better water at potentially less cost. While he doesn’t opposed the Lake Powell Pipeline outright, Brooks said it should be a last resort. Kemp supports the pipeline and said the cost to build it should be shared by all of Utah. Just as Southern Utah counties had to pay into water infrastructure projects across the state, the rest of the state should do the same for the pipeline, he said. The issue of public lands arose from a question over how to increase resources for education. Both Brooks and Kemp support Utah taking over management of the public lands and using them to economically benefit the people of the state. One the steps Kemp suggested in helping that come to pass is “demilitarizing” federal agencies like the Bureau of Land Management. “Once we demilitarize these organizations, I think we can begin the process of getting those lands back under the control of the state of Utah,” Kemp said. Another aspect of the public lands issue was the question of whether it is lawful under the Constitution to tell federal agencies like the BLM “no” while also backing up that stance with force if necessary. “It’s absolutely constitutional,” Brooks said in relation to the BLM specifically, but he added he was hesitant on the idea of using force. “Every time there’s been force, it’s ended terribly,” he said. Brooks said it was constitutional for Utah be in control of its own lands, and the state should use every peaceful and legal means needed to gain management of the public lands. When people think of government overreach, Brooks said, they usually think of it at the federal level and not so much at the state level. He added that county and city governments should have the freedom to run things as they see fit. As an example of the state overreaching into city issues, Kemp highlighted a piece of legislation proposed earlier this year that would take away a municipality’s ability to deny the establishment of short-term rentals. The primary election is June 28. 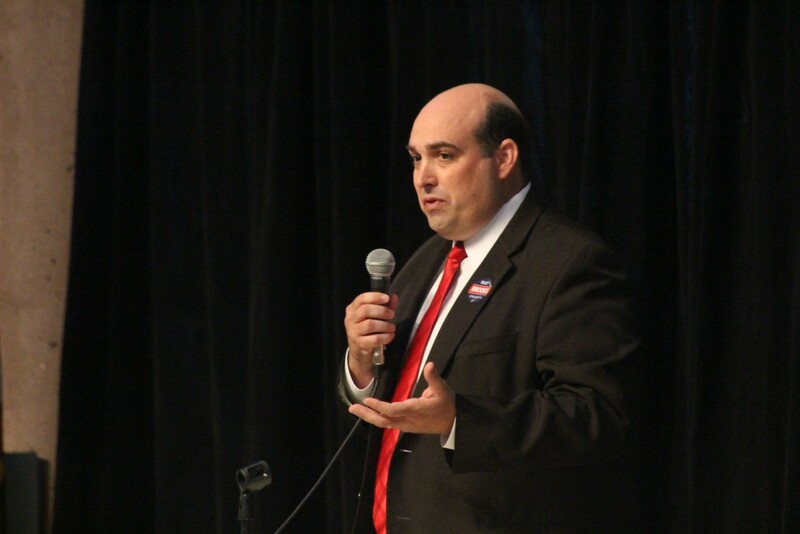 As there are no Democratic or third-party candidates running for House District 75, the winner of the primary will enter the general election unopposed.